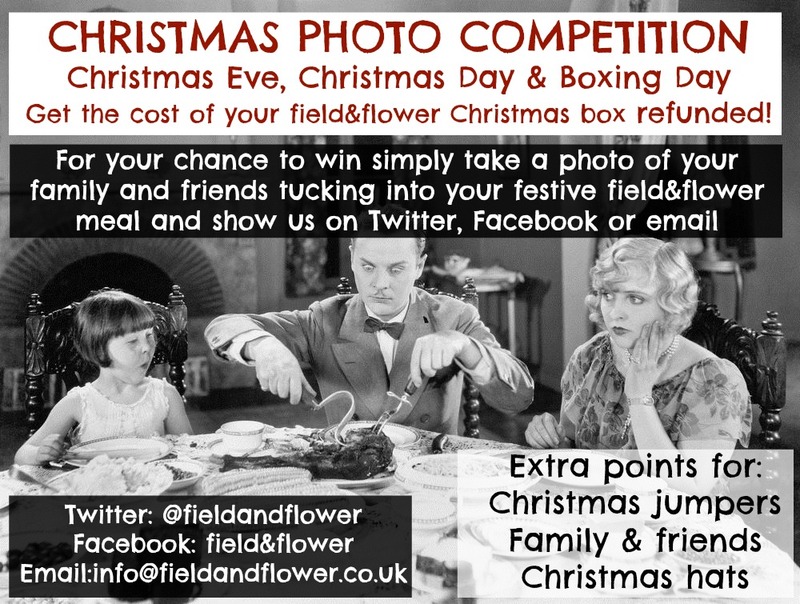 For your chance to get the full price of your Christmas box refunded simply send us a photo of your friends and family tucking into your field&flower Christmas meals over Christmas Eve, Christmas Day and Boxing Day. We’ll choose our favourite one and announce the winner in January. Remember, the more Christmas jumpers the better! A famous person, preferably a celebrity chef or David Beckham. James and James will choose the winners who will get their whole box (up to the value of £200) refunded. *Competition opens 24/12/13 and closes at midnight on the 26/12/13. The winner will be chosen on the 27th and announced by 6pm, the refund will be issued in January 2014. This entry was posted in Uncategorized and tagged christmas, Christmas competition, Competition. Bookmark the permalink.